I put together this Bordeaux 2016 vintage update for JancisRobinson.com and for Livex, the fine wine exchange. It’s been exceptionally dry during the holidays, with plenty of sunshine around Bordeaux. Most tourists have been on the beach, relaxing by the pool, strolling around markets or spending time in the city of Bordeaux itself. Those with an interest in wine might have visited the new Cité du Vin, which opened in June, or taken a trip out to Saint-Emilion. Those who have ventured out into the vineyards – beyond the refreshingly cool barrel cellars – might have seen how dry the ground looks. The parched grass verges contrast starkly with the lush green rows of vines, which are, for the most part, in remarkably rude health. 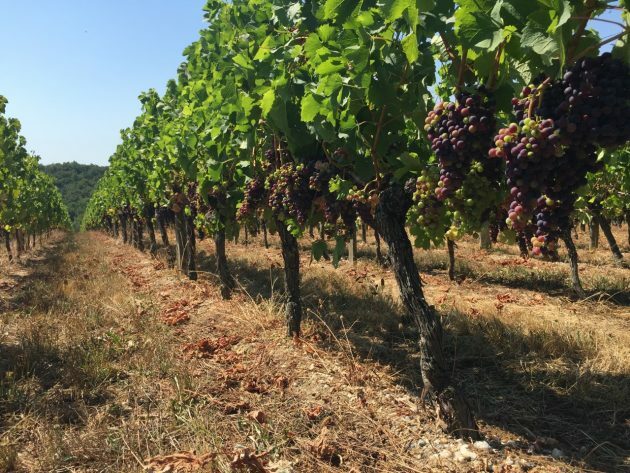 As you’d imagine, young vines with shallow roots on dry soils suffer when there’s no rain but, overall, the vines are coping well, especially given the heat over the French holiday this last weekend with temperatures consistently reaching 33°C or more. A glance down at the bunches and you’ll see the grapes are changing colour right now. Veraison is in full flow, as you’d expect in August, with the process in some vineyards almost complete and others not too far behind. Look closer still – if you’re at a more ambitious estate – and you can see the shrivelled bunches of grapes that were snipped off at the end of July or earlier this month. The so-called green harvest, when excess bunches are dumped on the ground to encourage those that remain on the vine to ripen more fully, can be quite shocking even to this experienced vine-spotter. 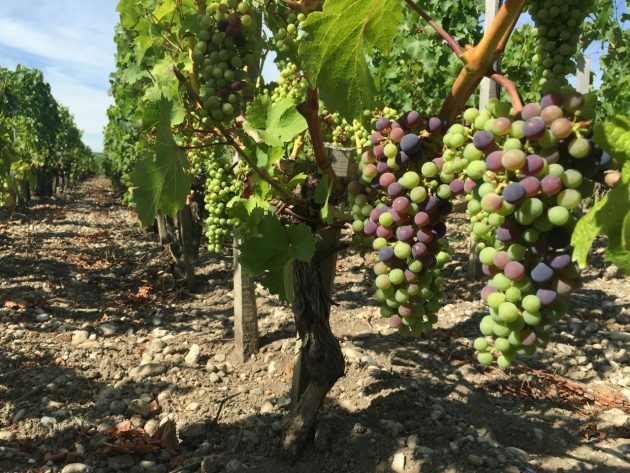 More green harvesting may yet follow, as veraison can reveal the bunches that are lagging behind. 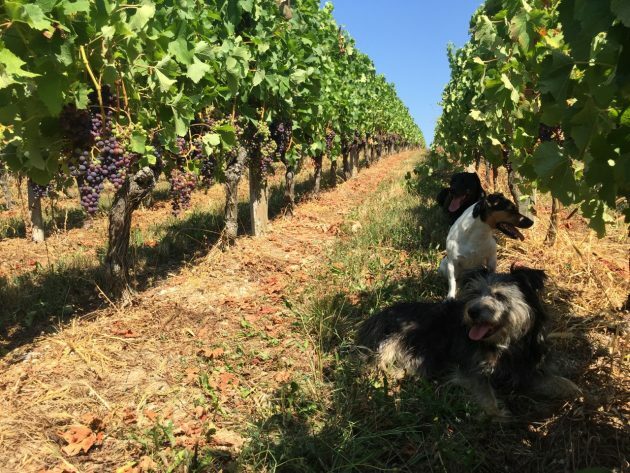 Brown leaves on the ground also show the efforts that have been made to expose the grapes to the ripening sun (as in the pic with the dogs above). It might be just on one side of the rows so far, with the second effeuillage to take place at the start of September for the final push – and to avoid potentially punishing sunburn to date on grapes that are exposed to the afternoon sun. That’s one of the remarkable things about this year. 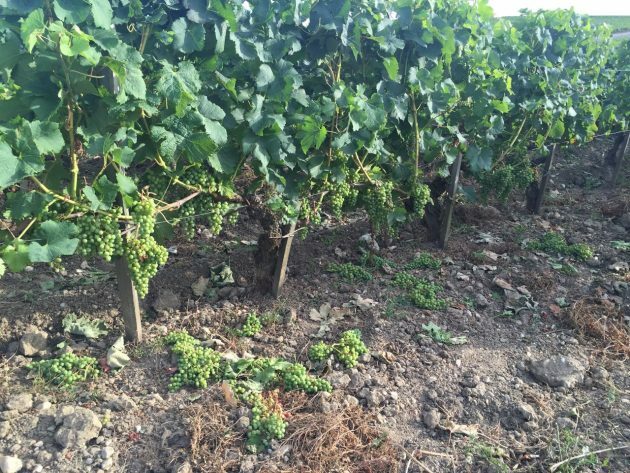 While some less fortunate regions in France will have significantly reduced crops as a result of damaging frost in late April and, in some cases, hail damage, many vineyards in Bordeaux are heading for a what appears to be a very decent crop. There’s a long, long way to go – a month for the white harvest and up to two months for the red – but the Merlot looks plentiful in many vineyards. Given that Merlot makes up two thirds of the red in Bordeaux, and that this vast region has close to 90% red, that’s an awful lot of wine. The consistency of the flowering on the Merlot, during the first part of June, came as a pleasant surprise to many viticulteurs. This one included. Merlot is susceptible to poor fruitset if the conditions aren’t right – notably coulure and millerandage when the berries don’t form properly – and the weather was decidedly mixed this June. We had good days and we had rainy days. The weather during the last two years at the same stage during flowering, however, was dry and sunny, and this had favourably influenced the number of potential bunches this Spring. The vines seemed to have more in reserve, as if the force was with them. Unusually, the fruit set on the Cabernet Sauvignon is more mixed, and the Cabernet grapes – say, in the northern Médoc – seem to be smaller than normal. That’s just my impression, mind, and that may not be bad news, qualitatively. It’s amazing how green and healthy the vines are after 8 weeks of almost no rain. Merlot on dry, gravelly soil at Chateau Bauduc, 16 August 2016. The number of potential bunches and the surprisingly successful flowering of Merlot is one feature of the season so far. Another is just how little rain we’ve had in the last eight weeks compared to the months before that. Ample rain in the Spring helpfully built up the reserves in the subsoils but added to the threat of mildew above ground. Some vineyards who fell behind on their treatments fell foul of this – black rot was also a risk – and this could certainly have a bearing on the eventual crop size. 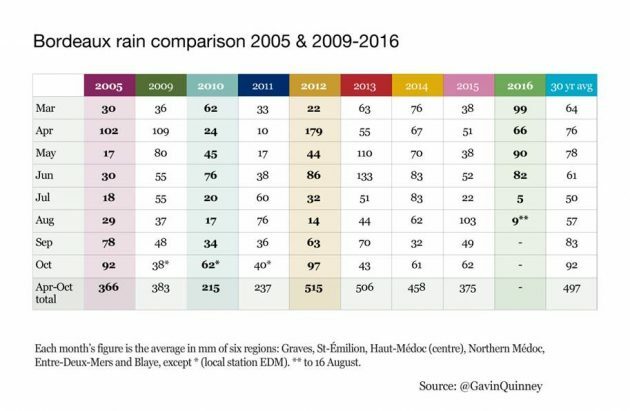 January and February 2016 were very wet (228mm and 138mm versus a 30-year Bordeaux average of 87mm and 72mm respectively) after a dry December. You can see from the table that, while April was in line with the average, March, May and June were relatively wet. And then we’ve had precious little rain – funnily enough since 23 June, a date which is memorable, for many of us, for other reasons. Temperature wise, we had a chillier Spring than the 30-year average: 1.3˚C colder in March, 1˚C in April, May was 0.5˚C colder than the norm and June 1˚C chiller (and 2˚C cooler than 2014 or 2015). July was normal at around 21˚C average. It is way too early to predict quality – we could do with a little refreshment, I feel, but any prolonged September rains could put a big dampener on things. It is worth noting though that the great years of 2005 and 2010 were dry in July and August. So too, however, was 2012, and that year we also had a wet Spring, as per 2016. 2012 was a good rather than great vintage, but it was a later harvest that was compromised by the threat of rot at the end. Because of the rain during the flowering in 2016, I do think there is a greater risk of botrytis at the end of the harvest if conditions go against us. The start of veraison (colour change) on Cabernet Sauvignon. Chateau Rauzan-Ségla, Margaux, 3 August 2016. If you’re planning on visiting Bordeaux during the harvest, 2016 won’t be an early one, despite the lovely, dry summer. 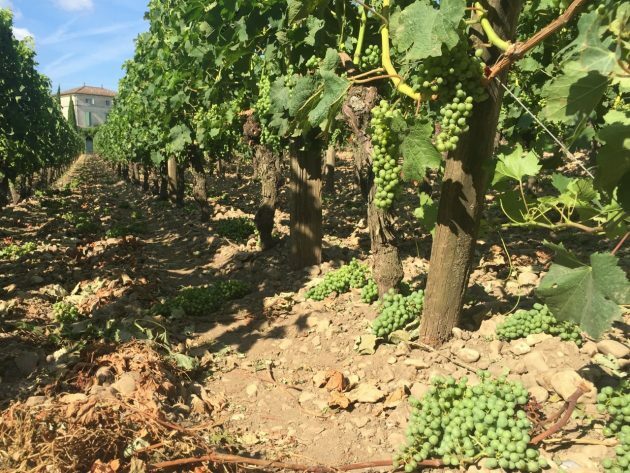 Some early ripening vineyards, such as in Pessac-Léognan, will start their whites early in September but expect the dry whites to mostly come in during mid-September and the reds, for the most part, in the first half of October. If you want to see how things are progressing in the vineyards around Bordeaux, I’ll be posting plenty of images on Twitter and Instagram @GavinQuinney using #bdx16.